This is the sixth and final part of Chapter Six of The Last War in Albion, covering Alan Moore's work on Skizz and D.R. & Quinch for 2000 AD. An ebook omnibus of all six parts, sans images, is available in ebook form from Amazon, Amazon UK, and Smashwords for $2.99. If you enjoy the project, please consider buying a copy of the omnibus to help ensure its continuation. The stories discussed in this chapter are available in the collections Skizz and The Complete D.R. & Quinch. Previously in The Last War in Albion: Alan Moore's D.R. & Quinch featured juvenile delinquency and massive amounts of destruction played initially for countercultural and satirical laughs, but eventually played for little more than its own sake. Early installments rail against corrupt authority and the cruelties of war, but the final storyline is a largely toothless (albeit terribly entertaining) satire of Hollywood. 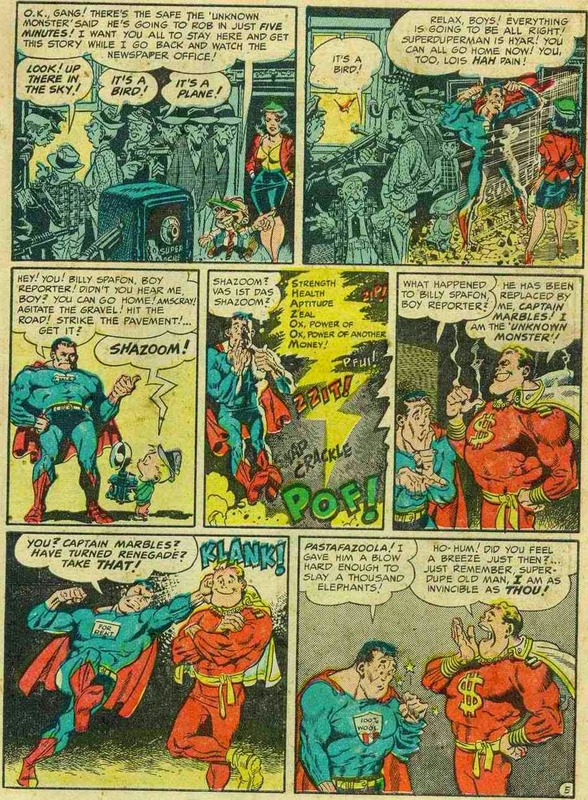 The specific style in question dates to MAD #4, from 1953, and from the acclaimed story “Superduperman,” although following the success of that story it became the house style for MAD. Still, “Superduperman” is a known influence for Moore, who has credited it as an influence for both Marvelman and Watchmen, and as such is as good a vehicle to describe the style as any. In many ways “Superduperman” reflects the style of short story that Moore characterized as a “list story” when writing Future Shocks for 2000 AD. Its structure is in effect a frame for going through a bunch of parodied aspects of Superman and, later, Captain Marvel. And so in rapid succession the strip introduces Clark Bent, Lois Pain, and Billy Spafon, who with the magic word SHAZOOM! (Strength, Health, Aptitude, Zeal, Ox, Power of, Ox, Power of Another, and Money) becomes Captain Marbles and proceeds to have an extended fight with Superduperman. The story drips with irony - Superduperman’s chest insignia constantly changes from panel to panel, often serving as various corporate logos or notes that the space is for sale, while Captain Marbles has openly given up being a superhero in favor of making money. All of this is a barely veiled parody of the then-current legal case between National Comics (the then-owners of Superman) and Fawcett Publications, who owned the at the time more popular Captain Marvel. Although there is a plot - Superduperman meets and fights Captain Marbles and finally defeats him by tricking him into punching himself in the head, only to find out that Lois Pain still considers him (quite correctly, given his habit of using his X-Ray vision to spy on the women’s room) to be a creep - the plot is, like that of “Sunburn” or “They Sweep the Spaceways,” mainly an excuse to pack in jokes, including elaborate sight gags within Wally Woods’ hyper-detailed art and various suitably awful puns in the vein of Clark Bent. The story is just a frame for this parodic work. And this describes the basic approach - MAD #10’s “G.I. Shmoe,” #7’s “Shermlock Shomes,” or #13’s “Prince Violent” are all basically the same structure: stories that exist to pack in a large number of humorous distortions of recognizable characters and figures. But in truth, Moore’s own investment in that humor was rapidly waning. Over time Moore came to conclude that, as he put in a later interview, D.R. & Quinch was “something that I don’t think has any redeeming social value. It makes violence funny, which I don’t think is right. I have to question the point where I’m actually talking about thermonuclear weapons as a source of humor.” This decision fits with Moore’s larger career arc at this time; by the time of D.R. & Quinch as an ongoing series for 2000 AD Moore was deep into work on Swamp Thing, a comic he filled with ecological sentiment. The final D.R. & Quinch story, “D.R. 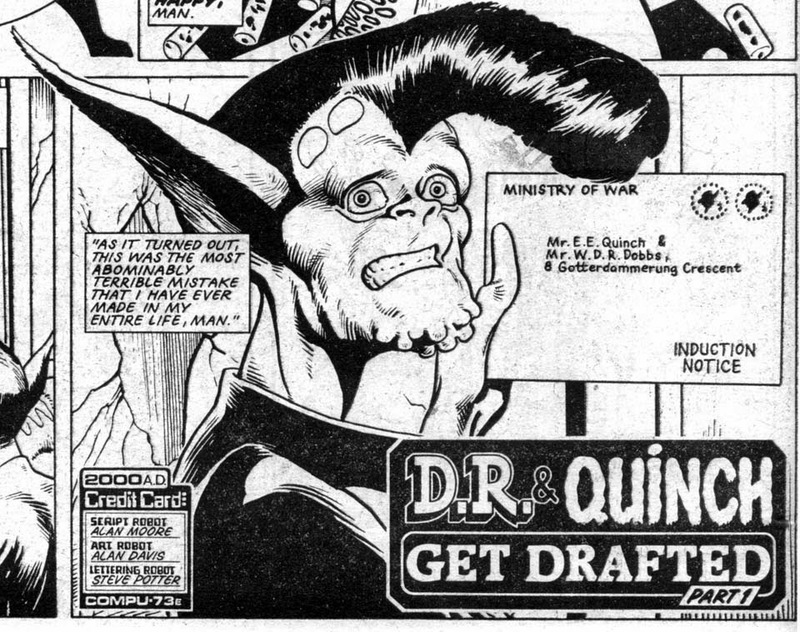 & Quinch Get Back to Nature,” came out in the 2000 AD Sci-Fi Special ’85, the same year as his famed “Nukeface Papers” story in Swamp Thing, in which artist Steve Bisette wove chilling present-day newspaper headlines about the horrific effects of nuclear power into the art. The idea that Moore would, as he put it, decide that D.R. & Quinch “is humorous in a kind of an Animal House way, socially irresponsible kind of way, but I’m not really that comfortable about making jokes about nuclear weapons” is wholly believable. strips featuring them as agony aunts. Beyond that, though, as Moore notes, “I probably got as many laughs out of it as I could.” By the final D.R. 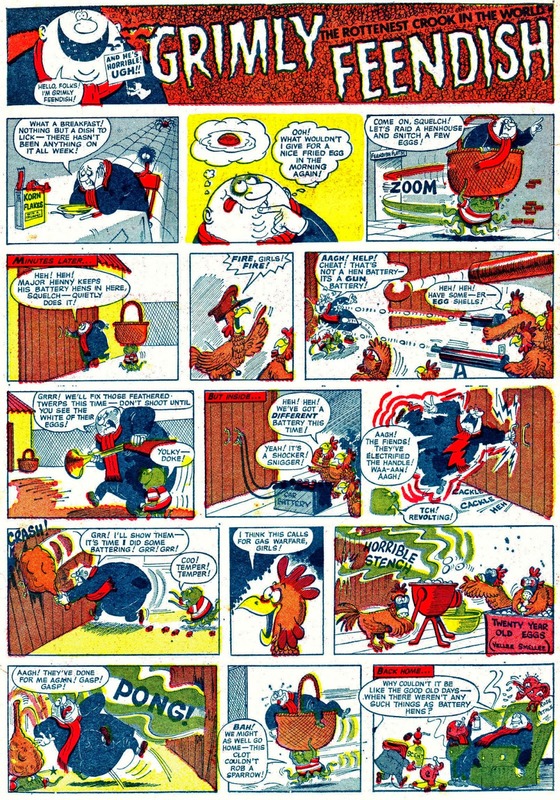 & Quinch strip Moore was reduced to recreating the sense of ridiculous violence of the first few strips by putting D.R. and Quinch in charge of a summer camp and having a strip narrated by one of the traumatized campers who writes home assuring his parents that “I sure am having a swell time at this summer camp you sent me to, and I am not being maltreated in any way.” As with the first few D.R. & Quinch stories, the humor lies in the fact that the reader is clever enough to grasp the irony in lines like this and the camper’s assertion that “our supervisors are responsible adults who certainly never get drunk and shoot out all the windows in the dormitory block.” But while this approach succeeds in restoring the central joke of D.R. & Quinch that had been largely absent since the conclusion of “D.R. & Quinch Go Straight,” the satirical bite remains gone. No longer are D.R. & Quinch railing ridiculously at the horrors of conventional authority: they’re just torturing kids by throwing them into patches of “mind-wrenchingly painful poison-stingwort.” Whatever philosophical objections Moore might have had to the nature of D.R. & Quinch’s brand of satire seem beside the point when that satire has been so completely bled out of the series through excessive repetition. 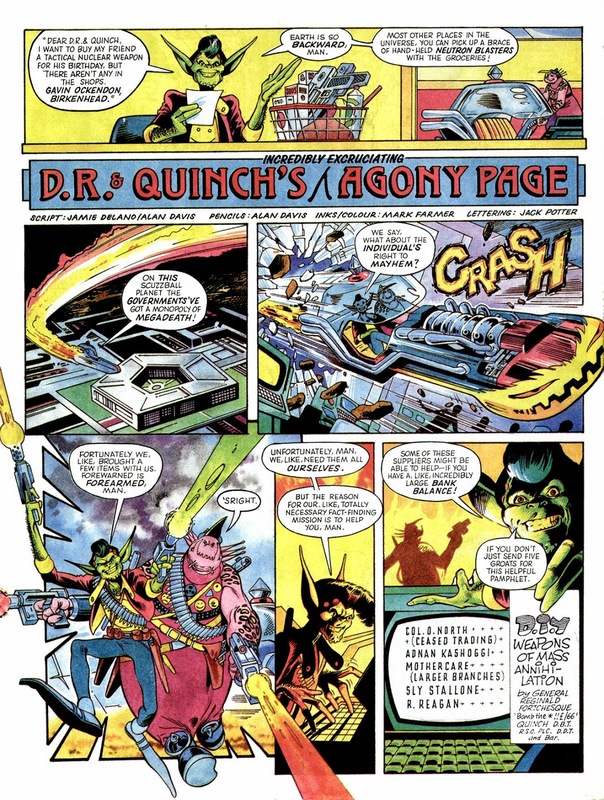 2000 AD’s 1987 attempt to revive the pair as a series of one page gags under the banner D.R. & Quinch’s Agony Page, written by Jamie Delano, proved similarly unpromising despite what is, on the surface at least, a nearly solid gold premise. While Moore’s writing may have flagged over the course of D.R. 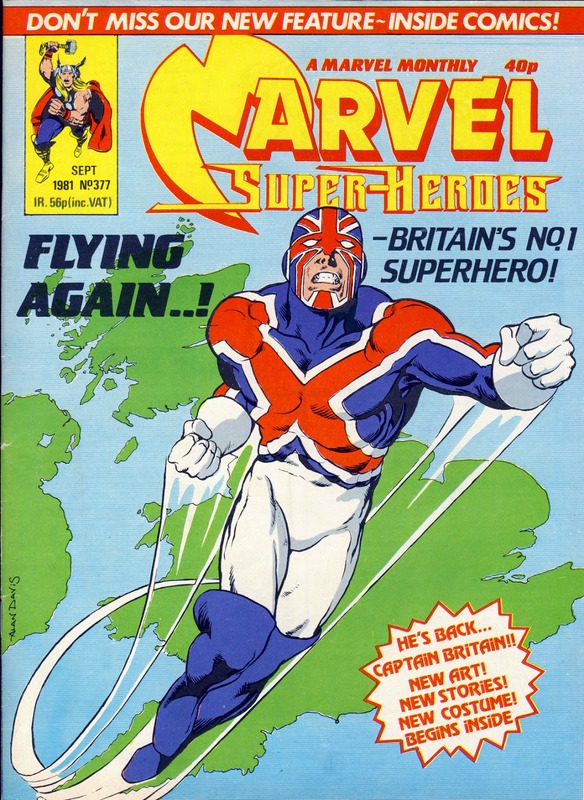 & Quinch, however, the work of his collaborator, Alan Davis, never did. Davis had been active and acclaimed for several years by the point of D.R. & Quinch, having done work with Alan Moore for both Marvel UK and Warrior, as well as a run on the Gerry Finley-Day 2000 AD series Harry Twenty on the High Rock. But these jobs had largely established Davis as, in his own words, “the gritty realistic artist.” Certainly Harry Twenty on the High Rock supports this - it’s a quite grim prison escape story with the sci-fi twist that the prison is “a hundred miles above the earth” and “crammed with 10,000 of the hardest, most vicious criminals from the world below.” The protagonist, Harry Twenty, formerly Harry Thompson, was sent to prison for smuggling food to starving islanders, and spends the bulk of the strip trying to escape. It is, as one would expect, violent and full of unsavory figures. The strip culminates with the prison being blown out of Earth’s orbit in the course of a prison riot, and ends with Harry effectively in charge of the prison and declaring, in an act of straightforward plagiarism of The Prisoner, that “I ain’t a number any longer. I’m a free man!” The ending leaves plenty of room for a continuation, but the strip was an acknowledged mess - Finley-Day’s scripts were described charitably was “in need of battening down and knocking into shape,” and less charitably as borderline incoherent: “the sentences don’t make sense,” as Alan Grant, who had the unenviable job of rewriting Finley-Day’s already paid for scripts. It wrapped in Prog 307, and was at that point replaced with Skizz. Davis describes the experience as stressful. “When Richard [Burton] got me along to the 2000 AD offices,” he explains, “Steve [MacManus] wasn’t really too impressed with what I was doing. He didn’t really like the idea of having an American-style artist for 2000 AD. I was almost on probation, in a way.” The spectacle of an increasingly acclaimed and popular artist who was doing fantastic work for two of IPC’s competitors being given a script that had been festering in the IPC inventory since 1982 because of its obvious problems closely mirrors the strange failure of IPC to give Moore ongoing work until he was on the brink of getting poached by American companies as well. Eventually IPC deigned to give the pair, who were well into their Eagle Award winning run on Marvelman over at Warrior a Time Twisters to do, which resulted in “D.R. & Quinch Have Fun on Earth.” Davis, for his part, was eager to shake off the reputation for grit he had acquired and, as he put it, “prove I could draw other styles of art,” and based his approach on Leo Baxendale’s Grimly Feendish strip from Odham’s Smash! and Wham!. Feendish, “The Rottenest Crook in the World,” as the strip described him, originated as a villain in Wham!’s Eagle-Eye Junior Spy before getting his own strip in Smash!, and was a would-be supervillain whose overly elaborate schemes inevitably ended tragically for him. 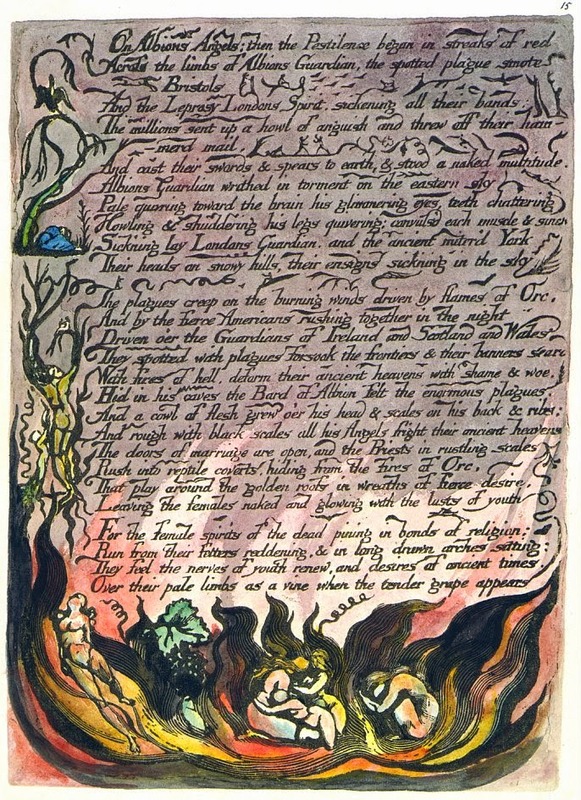 Depicted as a short, fat, grotesque with fangs, his influence on D.R. & Quinch is evident in Davis’s design for Quinch. manages no end of humor in the visual aspects of the transition. Davis’s non-comedic work had always benefited in part from his knack for drawing facial expressions, and he parlayed this skill into D.R. & Quinch, crafting the characters so that their faces were at once alien and tremendously expressive. Quinch generally remained impassive, as befitted his taciturn nature (virtually all of his lines across the series are simply “S’right.”), but D.R.’s supremely expressive face sells countless sight gags. Similarly, the transition of Chrysoprasia to Crazy Chryssie in “D.R. & Quinch go Girl Crazy” is accomplished largely through one single facial expression, emphasized by one of the few times Quinch’s stoic grin breaks down. Figure 305: D.R. 's silhouette is immediately distinctive. The transition is also helped, however, by Davis’s excellent sense of silhouette. All of Davis’s primary characters in D.R. & Quinch have instantly recognizable outlines, and the Chrsoprasia/Chryssie transition is handled by substantially altering Chryssie’s so that her previously downturned ears stick straight up (mirroring D.R.’s) and her neatly tied bun at the front of her head explodes into a front-hanging ponytail. D.R. and Quinch themselves, meanwhile, are constructed as a classic double act, with Quinch being the large and round character while D.R. is small and skinny. D.R.’s expressive face is framed by an instantly recognizable pair of sharply pointed ears and a comically large pompadour in the Elvis Presley/James Dean mould, tying him implicitly to a long history of rebellious youth. The art is crisp, clean, and entertainingly grotesque, giving the absurd excesses of Moore’s script a note-perfect execution. I'm going to stop commenting on The Last War as I always seem to be premature. That said, iirc Davis was never meant to be sole artist on Harry Twenty on the High Rock. He was originally meant to draw in tandem with John Watkiss, I believe. Watkiss decided against drawing it in the end, leaving Davis to draw Harry Twenty in its entirety, and the deadline nightmares that accompanied it. Oh, heavens, I should hate to have that happen: comments where people correctly predict where I'm going next are some of my favorites. And yes, you are correct about Watkiss. I almost had a bit about it in there, but it was a detail that didn't seem to support anything else in the narrative, so I couldn't quite work it in. To be fair, if we were on a forum I would have added a smiley of some kind after the first section. As to Watkiss, I do see what you mean there: the best way I could think of adding to the narrative is that Davies was pretty well in the same position as Moore at that stage of his career, and taking on all and any work offered to him, no matter the deadline or subject matter. This is something that would hold Moore in good stead when he went to DC (I know, I know, I'm getting ahead of the narrative again!). But there's an also interesting "what if" with John Watkiss, as he's very much the road not travelled by Moore or Morrison. I first became aware of Watkiss when he appeared on a documentary on Raymond Briggs of When The wind Blows fame in the early 80's. It was in a sequence about Briggs' other career as an art college lecturer at the prestigious Brighton College of Art, and Watkiss had some comic strip work up and was in a conversation with Briggs about it. It was obvious that Watkiss was very interested in comics and pursuing a career there, but somewhere along the way, even though he had the opportunity to pursue that career, he decided to go for a career in illustration instead, and only dipped his toes in comics on occasion afterwards. His comic art is luscious, although not in any way commercially viable in the current comics climate. His work is worth seeking out by any other readers of the Last War In Albion-- I would especially recommend the Vertigo series "Trigger," written by Jason Hall.